A picturesque sunrise behind the Hasty Student Life Center signals new life on a spring morning. 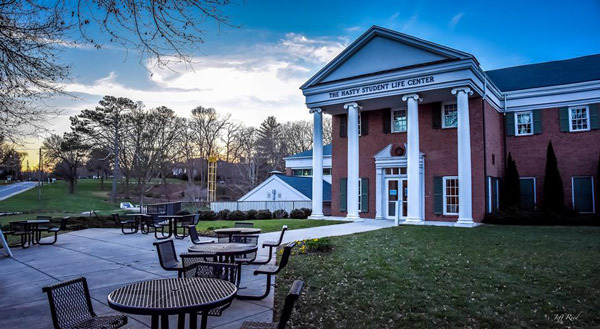 A community-wide Easter sunrise service will be held March 27, at 7 a.m., in the Gordy Dining Hall, located next to the Hasty Student Life Center on the campus of Reinhardt University. Enjoy a sunrise service on the beautiful campus of Reinhardt University Easter Sunday, March 27, at 7 a.m., in the Gordy Dining Hall. This community-wide worship service is sponsored by the Reinhardt Ministerial Association in cooperation with Waleska United Methodist Church, Shoal Creek Baptist Church, Red Sea Church and Heritage Baptist Fellowship. Everyone is welcome. A pancake and egg breakfast will follow in the Gordy Dining Center on campus with donations being accepted for those wishing to contribute to the cost of the breakfast. Additionally, an offering will be received for a local ministry.